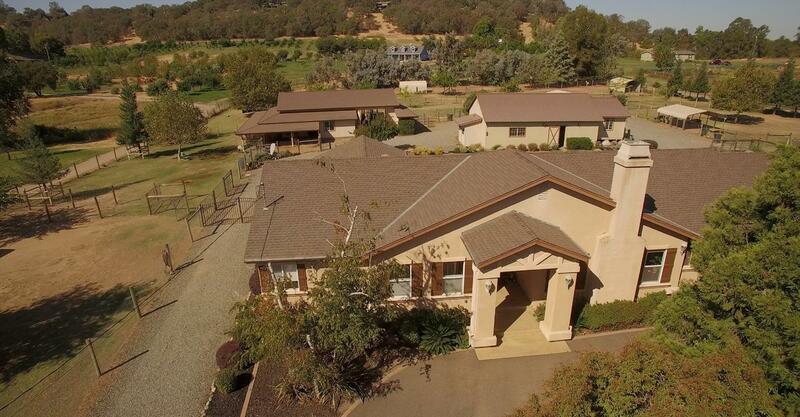 Exceptional Value in Loomis - Custom 4/3 Home with huge Bonus Room on 3 irrigated acres surrounded by Organic Orchard. Cross-fenced for livestock, 4-H projects, or Horses.Kitchen features cherry cabinets, stainless steel appliances, wood floors, granite counters, crown molding, Whole House vacuum. Master Bath features jetted tub and tiled walk-in shower. Stable & equipment/hay barn w/running water, electricity & convenient outdoor restroom. Assumable solar 18, 230 KW w/Sunny Boy Inverter, irrigation w/2200 water storage tank. Great entertaining floorplan flowing to Outdoor kitchen, gas firepit and fountain. Every inch of this property is hardscaped, irrigated and manicured. Bring your fussiest buyer.